I was recently sent a box of Skinny Tan products to try out. Knowing the experiences I have had with self tanning in the past I was curious to see if this much talked about tanning brand lived up to the hype. They have been featured on Dragon's Den and I have only heard good things so let me tell you how I got on! The packaging is lovely. I am a sucker for decent packaging and the colours and branding are great. I love the shape of the tubes and the little screw tops. So much less messy than the flip top bottles I have used in the past. I thought I would give it a sniff before applying to my skin and it smells amazing. Not biscuity and full of chemicals like other brands, more like a coconut/cocoa butter scent that reminded me of summer holidays. Off to a good start! I tried out the 24 Hour Bronzer first as this is their 'instant tan' which can be washed off. I prefer this type of tanner as it allows you a bit more control over the colour and you can start again if it goes a bit wrong. I tend to use these for nights out etc where I want a bit of a glow but can't be bothered waiting for it to develop. I really like this one as mentioned it smells great and blends nicely as a natural looking tan. A few days later I had the chance to get a nice shower in peace so I used the Pre-Tan primer which was lovely too. A gentle exfoliator with crushed walnut shell in (no blasted microbeads here!) which gently rubbed off any dead skin cells ready to tan. I also used the Exfoliating Prep Mitt to make sure my skin was extra smooth and actually it felt great to give my skin a good scrub. Allowing my skin 24 hours to settle I decided to use the 7 Day Tanner the next day so avoided moisturisers before applying the tanner. The 7 Day tanner is contains Almond Oil and Gurana to help reduce the appearance of blemishes and cellulite. I applied it as best I could although I do need to pick up a tanning mitt before my next application as it didn't go on as smoothly as it would with a mitt. I also missed a patch on my back I couldn't reach but you live and learn! The tanner has a bronze guide which allows you to see where it is when applying but this isn't the finished result...trust me I looked awful until I washed the bronzer off. So I popped my (Christmas) onesie on after application so as not to get it all over my sheets and went to bed. The next morning I woke up with lots of patches but after a quick shower with just water (no soap else the tan may not work as well) all the patchiness had gone. I was left with a lovely sunkissed glow. Top - After Application Bottom - Next day after removing residue. The colour wasn't as obvious as I expected but that suited my skin tone as I would have looked awful with a dark tan. I think it made me look healthier and definitely gave me a bit of confidence. I had some issues on my tummy where I have regrowth from unwanted hair in pregnancy but nobody needs to see that. So overall I was really happy with the results. 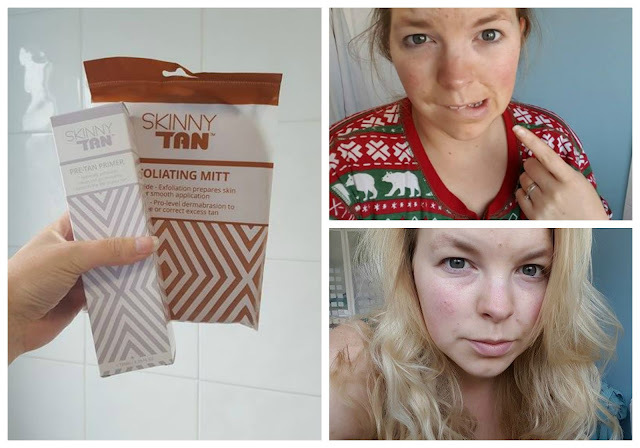 I do think Skinny Tan is a bit more expensive than I would normally pay for a tanning product which is probably why mine have always been so awful. However if you are used to spending a lot on spray tans etc then this is a lot cheaper. The prices are all on the website if you want to take a look. They also have a pre-season sale on where you get a free Tanning Mitt and Exfoliator Mitt with 2 bottles of the Dark Mousse.